You know this kind. This is the kind where it's in a sealed package and the ONLY, ONLY way to get it open is to cut it. If, heaven forbid, you have purchased the wrong item, you have irreparably damaged the packaging. And if you are not careful, the opened edges are razor sharp and will cut you. It matters not that the entire thing can be recycled. I think this is an egregious example of packaging gone wrong. 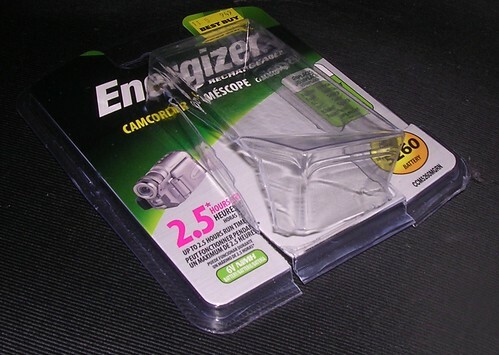 You can see how I had to mangle this package to remove the camcorder battery. All the time I'm doing this, I'm hoping that I got the right battery for the office camcorder. I'd like to know if batteries really are shoplifted in such quantity that they need to be this over packaged.